This pretty girl is Regan, a 6-8 month old Border Collie/English Springer Spaniel mix. She is very attractive with her wavy black coat and brown markings. Regan is a very shy girl, but she really wants attention. She will try to snuggle up to you, but has no confidence. She will need a patient and gentle person who will give her time to adjust. 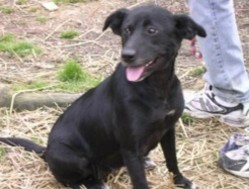 Once she builds some confidence and is in a stable home, this girl will blossom and prove to be a very loving friend. She is fine with other dogs. She is waiting for someone to love her. Shawn was dumped on the side of the road along with his sibs and Mom. He is 14 to 15 weeks old now and just the nicest, easy going pup. He is friendly and almost as tall as Mom already. He is very crate trained and very quiet and good in his crate. Mama dog is Sheena and she's 30 lbs, but these pups may be slightly larger when grown. 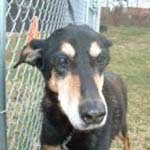 Annie is an adorably sweet 7-8 year old spayed female Dobie who was languishing at a high volume shelter. A kind woman pulled her in on faith that Save A Dog would rescue her and we did! She was tested with another dog and she was a wonderful calmer to the other dog. She is all sweetness and kindness and we are looking for an owner who is the right match for her. 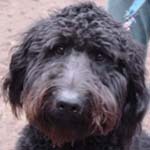 Chewbacca is a ten month old Labradoodle who was originally relinquished because his family could not meet his exercise needs. He needs a fenced in yard and lots of play time. He is a delightful dog who has a lot to offer. He knows sit, lay down, and bring me the ball. 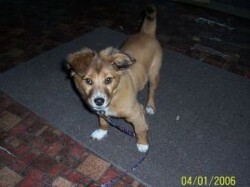 Toby, a sheltie/beagle mix pup, is approx. 4 months old and weighs about 20 lbs. He is learning to walk on a lead and is good with other dogs and cats. He is very friendly. We will accept applications for Sheena via our Web application process. Please see our puppy adoption requirements before applying. 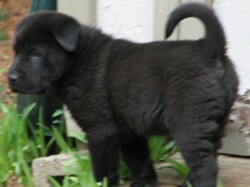 Big Boy is a 9-10 week old male pup who is from a litter of Lab Sharpei mix puppies we took in. He is a big baby, even though his name is Big Boy. He's only slightly larger than his littermates. 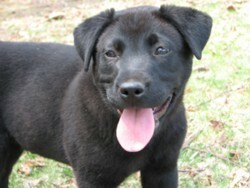 He is a sweet puppy with a gorgeous head and coat and most importantly, a nice personality. Fenced in yards for families with kids and no more than 3 hours alone total for the day. They are too young for doggy daycare. This gorgeous girl is Chaise. She is approx. 6 mos old and weighs between 25 and 30 pounds. She has a soft thick white coat with brown markings. 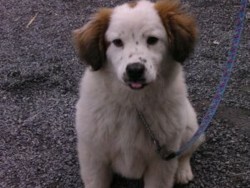 She looks a little like a St.Bernard and will be large when full grown. Very sweet, submissive girl. We will accept applications for Chaise via our Web application process. Liberty is an adorable border collie mix 10 weeks old. Please read our puppy adoption requirements before applying. 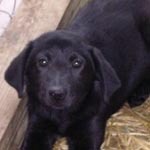 Little Girl is a 9-10 week old Lab/Shar pei mixed breed puppy. She looks like a little piglet with her curly tail. She is very much crate trained and almost house trained as well. 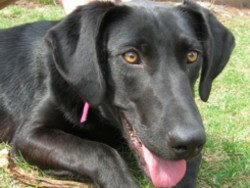 She has the natural curiosity of a pup and needs a stay at home or work from home. 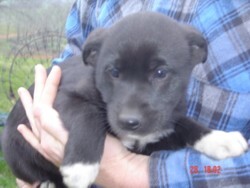 Morgan is an adorable border collie with a touch of sharpie mix, 10 weeks old. Please read our puppy adoption requirements before applying. Sam was dumped on the side of the road along with his sibs and Mom. He is 14 to 15 weeks old now and is a really sweet pup. He is friendly and outgoing and extremely playful. He is very crate trained and very quiet and good in his crate. Mama dog is Sheena and she's 30 lbs, but these pups may be slightly larger when grown. Please read our puppy adoption requirements before applying. No more than 3 hours alone total for the day and fencing is required for families with kids. Sheena is approx. 2 to 3 yrs. old. 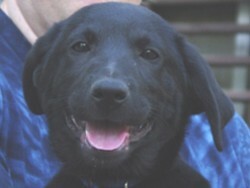 She is very friendly and was a super Mom to her pups (the 3 lab mix puppies also available after 4/11. She only weighs about 35 lbs. and isn't much bigger than her pups. Meet Valentino! 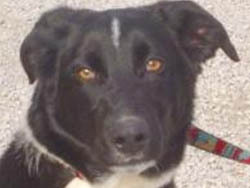 He is a handsome guy who is black with some white markings true to a border collie. This puppy is one of a litter of 3 that was brought to a shelter by his person. He is 8-10 months old. 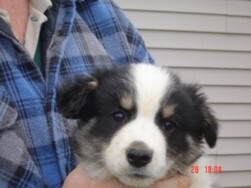 His paperwork says Border Collie/Australian Shepherd, but he looks like a pure Border Collie to us. He has an unbelievable coat and gorgeous markings. He is about 45 lbs. and as handsome as they come. He is shy with some men so needs a gentle touch and a patient adopter. He was never abused, but just came from a farm where he was not socialized well with humans. He is crate trained, never had an accident and he is not a leg lifter. Like any pup, he will need to be supervised or crated. 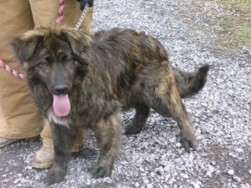 He is a low to medium energy dog and would make a nice companion for someone, hopefully in a quiet home. 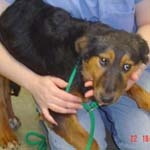 Sody is a Border Collie and German Shepherd mix, born 8/1/05 and weighs approx. 60 pounds. He has the most gorgeous long coat, black with brown highlights throughout. He is very lovable so doggie kisses can be expected everyday. He started his obedience walking and would do well going to classes since he learns quickly. This handsome boy needs to go to a home where he will get plenty of exercise and play time. He would be great with teens as he is so much fun, but probably too big for little ones. You won't find a more lovable and handsome pup. You might remember Sonny, who was available last month. Sody is his brother.